Climate change and energy scarcity pose challenges for the sustainability of the Mississippi River Delta and its future restoration. Projected trends for climate change suggest increasing risk in the coastal zone from sea-level rise, more frequent high-intensity hurricanes, and increased Mississippi River discharge. Simultaneously, analysis of energy return on investment suggests that energy is becoming more expensive and difficult to produce, which does not bode well for energy intensive activities like building river levees and pumping dredged sediment. For these reasons, while coastal restoration is becoming progressively urgent, its implementation will be both challenging and expensive. 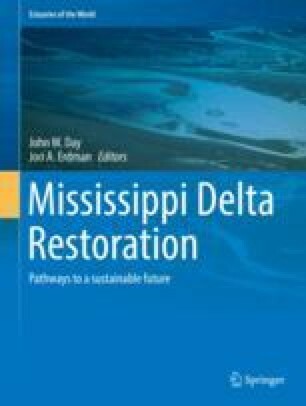 The objective of this chapter is to introduce the basic science behind climate change and energy, and discuss its relevance to the Mississippi River Delta. The evidence presented here makes it clear that the current management of the delta is unsustainable, and an aggressive new approach based on the natural functioning of the delta is required in the future.